JAMAICA.KEY COUNTERMARK ON SPANISH COLONIAL of the Island of HISPANIOLA / SANTO DOMINGO.Charles and Joanna AD 1504-1516-1555.AE.4 Maravedis.ND. JAMAICA.KEY COUNTERMARK ON SPANISH COLONIAL.HISPANIOLA / SANTO DOMINGO.Charles and Joanna AD 1504-1516-1555.AE.4 Maravedis.ND. Ref: for host coin CCT 214, countermark De May ,Contremarques 62/3. Hispaniola was the name given to the island by Colombus which was later changed to Santo Domingo ( after Saint Dominique ). SPAIN.County of BARCELONA.Alfonso I ( II of Aragon ) AD 1162-1196.Billon Dinero. SPAIN.CASTILLE AND LEON.Henry III AD 1390-1406.AE.Blanca.Mint of BURGOS. 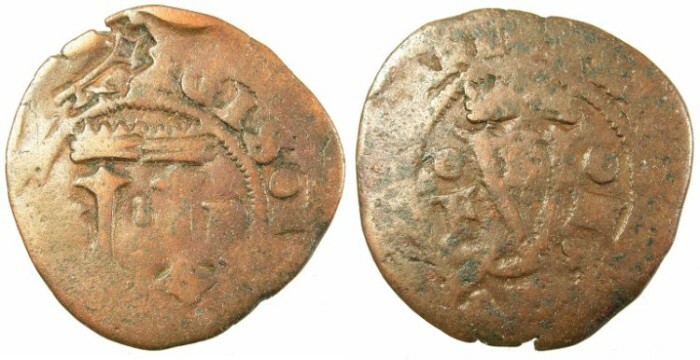 SPAIN.BARCELONA.Peter I ( II of Aragon ) AD 1196-1213.Billon Denaro. SPAIN.County of BARCELONA.Alfonso I ( II of Aragon ) AD 1162-1196.Billon Denaro.